The UN nuclear watchdog, the International Atomic Energy Agency (IAEA), has thanked Iran for providing the agency with information about the construction of its new pilot enrichment plant. “With reference to the letter of 21 September 2009… from HE Ambassador Soltanieh to the Director General of the Agency Dr ElBaradei, I wish to thank the Islamic Republic of Iran for providing the Agency with information about Iran’s activities related to the construction of a new pilot enrichment plant,” read a letter by the IAEA to Iran, a copy of which was obtained by Press TV. Iran, on September 21, informed the agency that it was constructing an enrichment plant in Fordu, south of the capital Tehran. The plant will be, according to senior lawmaker Hassan Ghafouri-Fard, used as a backup facility to Iran’s first enrichment facility in Natanz. Iran, a signatory to the Nuclear Non-Proliferation Treaty (NPT), says its program is solely aimed at the civilian applications of the technology. 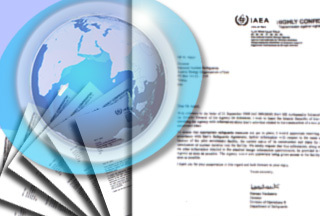 “To ensure that appropriate safeguard measures are put in place, I would appreciate receiving, in accordance with Iran’s Safeguards Agreement, further information with respect to the name and location of the pilot enrichment facility, the current status of its construction and plans for the introduction of nuclear material into the facility,” continued the IAEA letter, signed by Herman Nackaerts, Director of IAEA’s Division Of Operations Department Of Safeguards. Iran, under the Safeguards Agreement, is obliged to inform the IAEA of a new facility six months before using it for nuclear purposes. Tehran, however, informed the IAEA of the construction about a-year-and-a-half before the introduction of nuclear material. The disclosure of the letter comes hours before Iran is to meet with the six world powers — the five permanent UN Security Council members plus Germany — in Geneva to discuss a wide-range of global issues, based on the country’s package of proposals released earlier in the month. However, Britain, France and the US, which accuse the country of pursuing nuclear weapons and endangering the Middle East with a nuclear arms race, plan to use the opportunity to press the Tehran government on its enrichment activities. This is while European Union foreign policy chief Javier Solana, who has represented the West in nuclear talks with Iran since 2003 and will be present in the meeting on Thursday, had promised Iran’s top nuclear negotiator, Saeed Jalili, that the talks would center on the proposals package.